This month, the FDA's Center for Tobacco Products (CTP) updated a chart purporting to show trends in youth tobacco use over the past 5 years. 1. Youth cigarette use (among high school students) dropped by a huge amount from 2011 to 2016. 2. Cigar use dropped substantially from 2011 to 2016. 3. Pipe use dropped substantially from 2011 to 2016. 4. Smokeless tobacco use dropped slightly from 2011 to 2016. 5. Hookah use was essentially the same in 2011 and 2016. 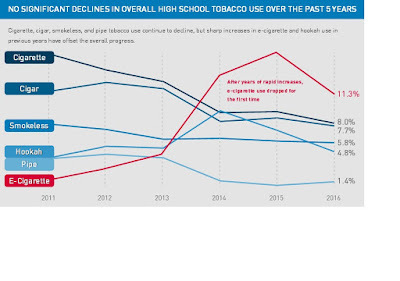 What happened to overall use of tobacco among high school students during the time period 2011-2016? 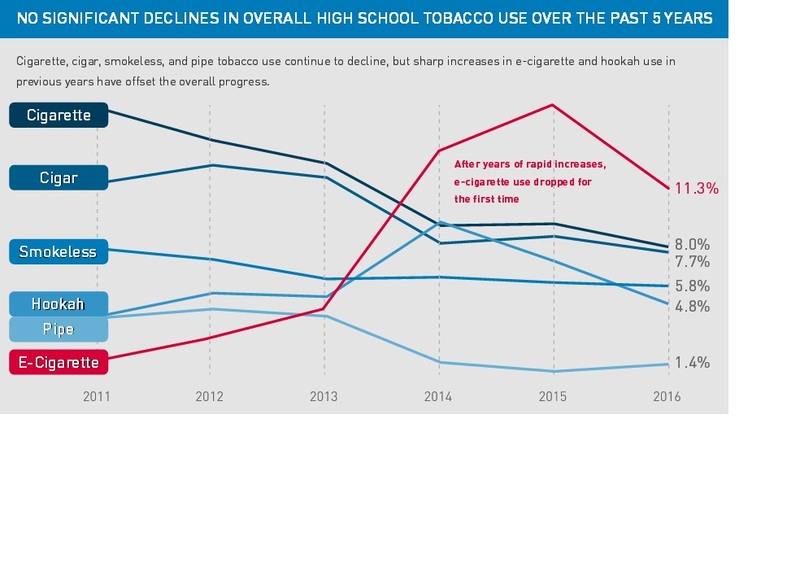 It doesn't take any fancy math or statistics to figure out that overall tobacco use among high school students must have declined substantially from 2011 to 2016. Since youth cigarette use dropped by a huge amount, cigar use dropped substantially, pipe used dropped substantially, smokeless tobacco use didn't change much, and hookah use didn't change much, it stands to reason that overall tobacco use went down substantially. There is no way that youth tobacco use went up or even stayed the same from 2011 to 2016 because it dropped substantially for three categories of use but didn't change much in the other two categories. But that is not what the Center for Tobacco Products chose to tell the public. The CTP chose to tell the public that there was no significant decline in overall tobacco use over the past 5 years. However, as I showed above, that is simply not true. Youth tobacco use declined substantially. So how does CTP justify this dishonesty? It plays a trick on the public. It classifies e-cigarette use as a form of tobacco use and includes e-cigarette use in the totals for overall tobacco use. Since there was a huge increase in e-cigarette use from 2011 to 2016, CTP is able to completely undermine the fact that there was a dramatic drop in youth smoking, cigar use, and pipe use by adding youth who experimented with e-cigarettes. This is dishonest and inaccurate because e-cigarette use is not a form of tobacco use. The truth is -- and CTP knows this -- that e-cigarettes do not contain tobacco. In fact, the whole point of e-cigarettes is that they are an alternative to using tobacco. The rest of the story is that the Center for Tobacco Products is lying to the public. This is unfortunate because it risks losing the public's trust. It is also unfortunate because this deception could have deleterious public health effects, as misinforming people to think that e-cigarettes contain tobacco may dissuade many smokers from quitting and may even induce many ex-smokers to return to smoking. On top of all of this, it is - in my view- unethical to lie to the public, even if the aim were to discourage us from engaging in a potentially harmful behavior. I think the public deserves to know the truth. Someone has to start telling them the rest of the story. Note: Thanks to Clive Bates for alerting me to the deceptive headline in this dishonest communication.